Let me just say, Aminder Dhaliwal is a fantastic artist who I just found out has worked under major corporations like Disney and Nickelodeon – the very fact that I’m finding this out now surprises me, since I tend to follow with major cartoonists on twitter/instagram, yet I found her personal comic before I found her most well known works. Admittedly, I stumbled on Woman World expecting nothing amazing, solely based on the icon that represents it on Line Webtoon, a webcomic publishing company. The icon is of a sketchy lady entirely naked, with pubic hair, shouting above people “THE MEN ARE EXTINCT”. I was bracing myself for something out of the deepest shades of Tumblr feminism that would make me cringe…. not because of the raw feminism, which is sometimes downright toxic, but because I know exactly the kind of backlash it would receive if this was anything I was predicting. In Woman World, Aminder Dhaliwal creates a story that Earth, in the distant (?) future, exists entirely without men. As per the opening line, THE MEN ARE EXTINCT. This is Earth with only females. This has to be the most feminist experience imaginable. And I suppose it is, but it’s never discussed, and that’s the key. 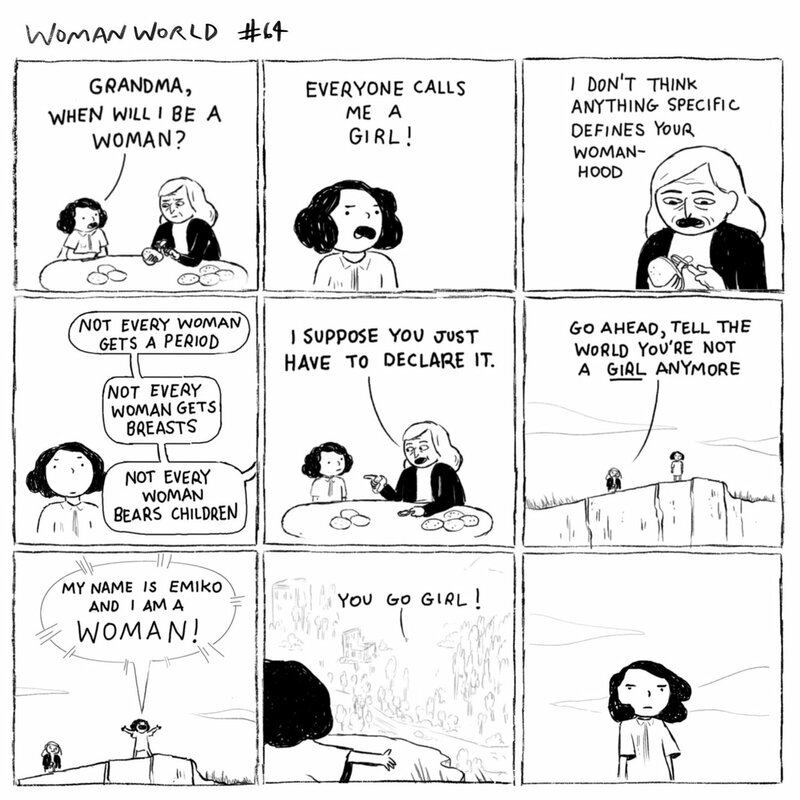 This comic does not directly say “feminism”, “feminist”, “oppression”, “inequality”, “sexism” or any of the key words that one would assume would be present in a world that is in its absolute essence, a feminist world. Feminism is never discussed, but it’s not avoided either. There’s no reason to, everyone is a woman. Here’s where Aminder Dhaliwal shows her creativity: In a world of only women, feminism… doesn’t really exist. In a world where everyone is the same, everyone’s rights are the same. I had to include at least one piece!